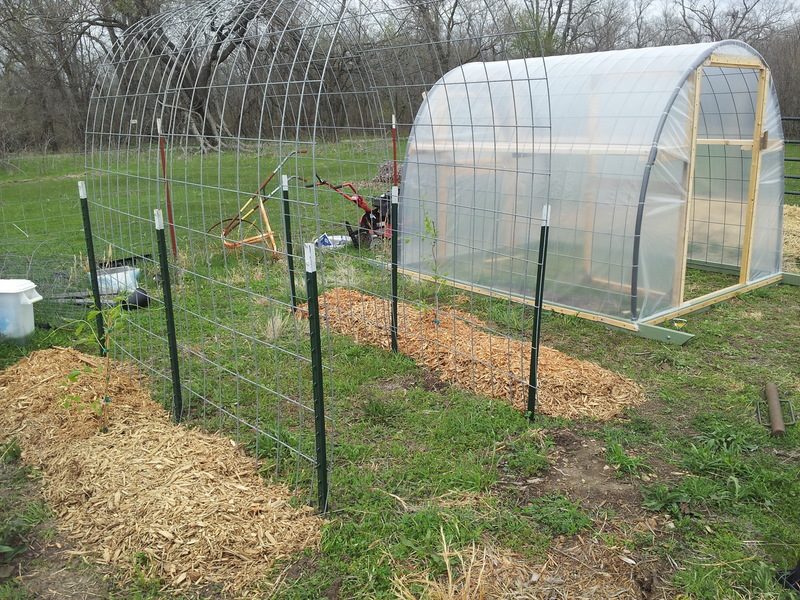 The TexasPrepper2 greenhouse is all set in it’s permanent space in the garden/orchard, that trellis in the front is our newly planted hardy kiwis, I will be following up on them in the future. 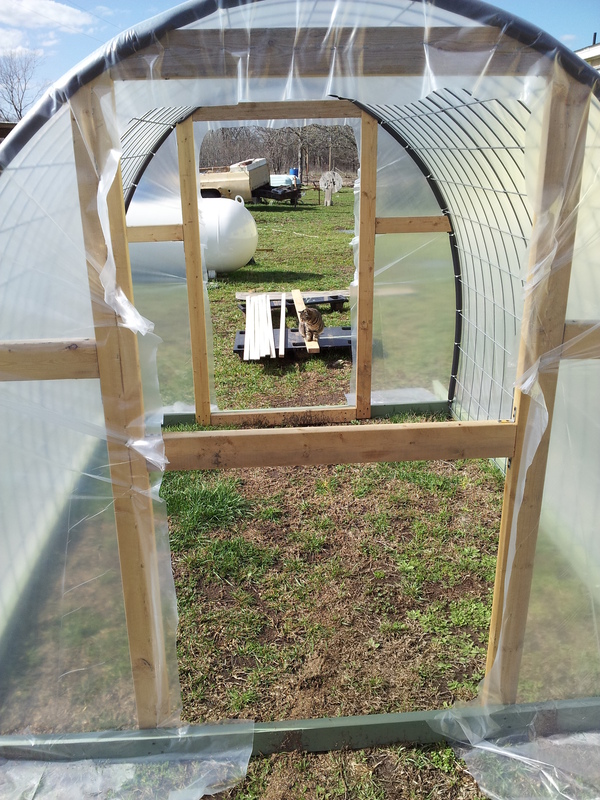 As far as the greenhouse goes, the rest of this post will kind of show you how we got to this point with it. What I won’t be doing is giving any particulars about dimensions because he is now selling a book with plan on amazon and it would be like stealing from him to do that. Go buy his stuff! 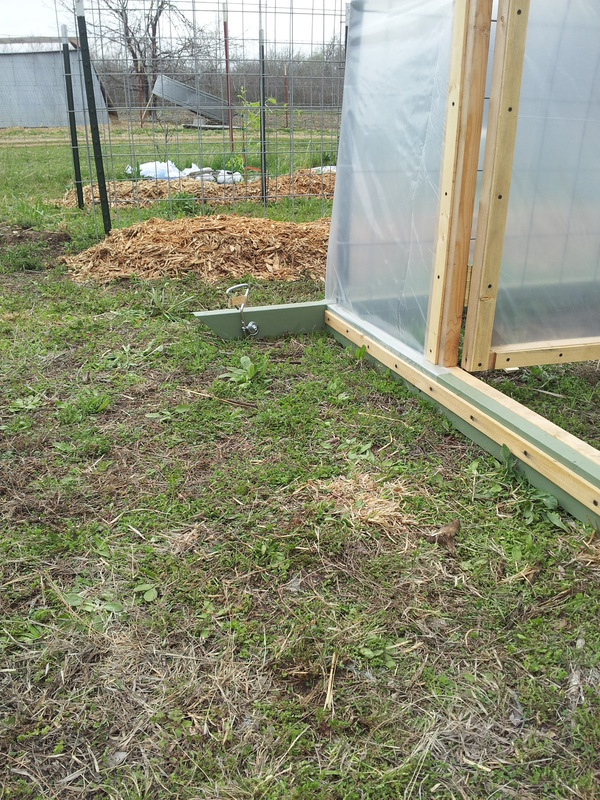 This is our test fit of the two cattle panels in the frame. 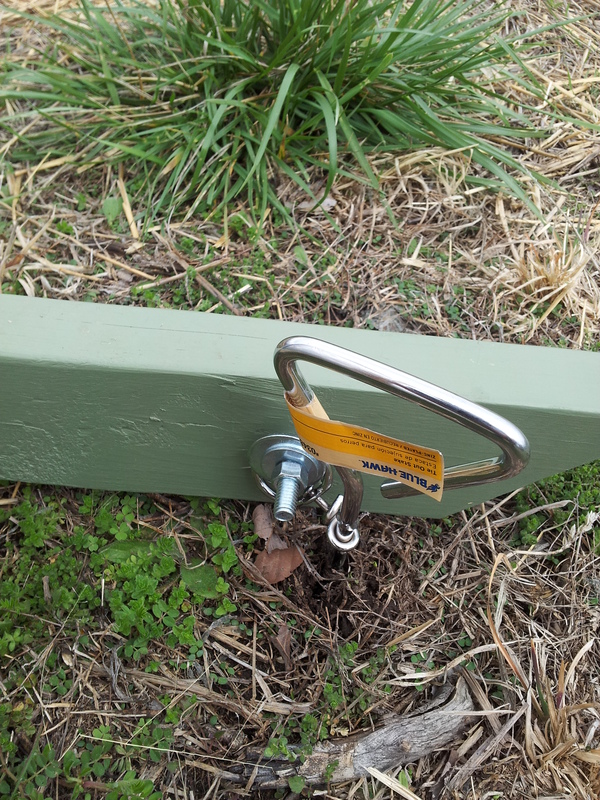 It was then tacked to the side skids with 1.5″ fence staples. This is after the panels were attached to the skids, we decided to paint the skids since we did not use pressure treated lumber. 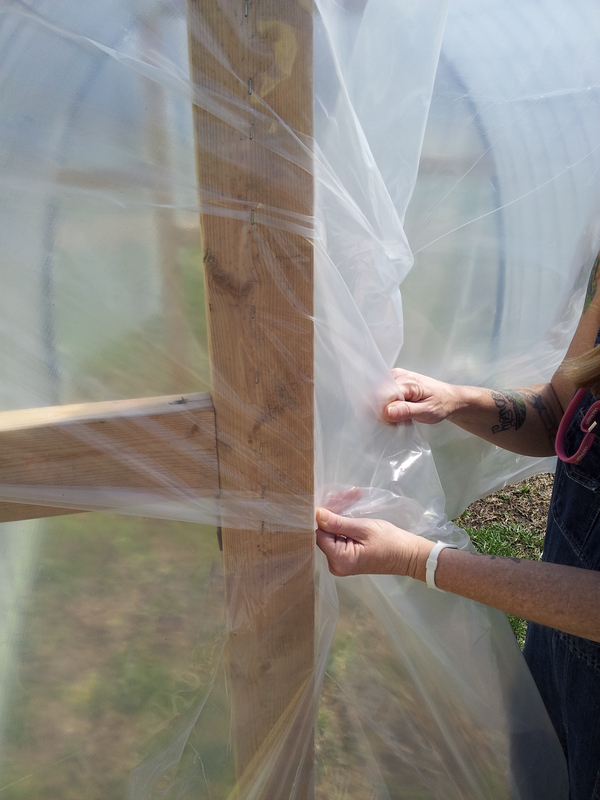 You will also notice the black foam pipe insulation used to protect the plastic covering from the ends of the panels are snugly zip tied into place. We laid it out like this to get the proper length for our first cut. We bought 4 mil plastic on a 15’x25′ roll and luckily we will be able to use that one roll for two, count’em two, covering jobs. Here we have the full test fit look going on. This is where we took a break to bask in the beauty of it all, get a drink of water and think about the best way to start the attachment of the plastic. TexasPrepper2 tells exactly how to do it, but I always try to think of different and possibly better ways to do things. I couldn’t come up with any so we followed the directions and started stapling it to the skids. Once it was stapled to the skids we started pleating and stapling it to the door and window uprights. That cleared the way for us to staple it to the frame between the skids. We cut the excess material away from the doorway and window so that we could work more easily. First we had to make them so we ripped a bunch of 2″x4″ boards into 1/4″ strips and pre-drilled them so that they would not split when we screwed them in to place. When it was completely fixed to the frame work it was time to reinforce the plastic by attaching wooden strips over the areas where the plastic was stapled like around this door frame for example. 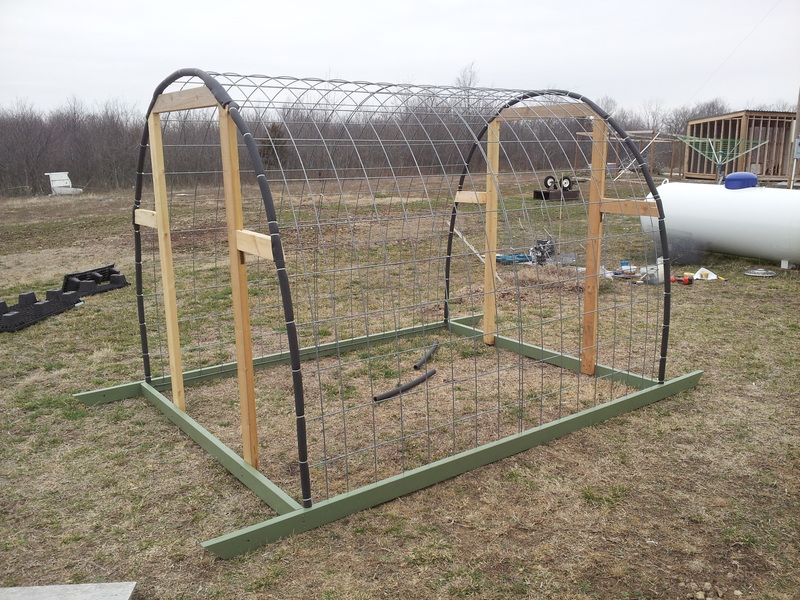 Here is the window frame all reinforced. We reinforced the areas below the door and the window first then we did the skids. Coming right along huh? Ma is a hard worker and she is precise, I like that a lot. And wouldn’t you know it, as soon as I say that she goes goofing off. Once Ma’s Ma and Pops got here we went to work and have pretty much been busy doing all kinds of things for the last 10 days or so. 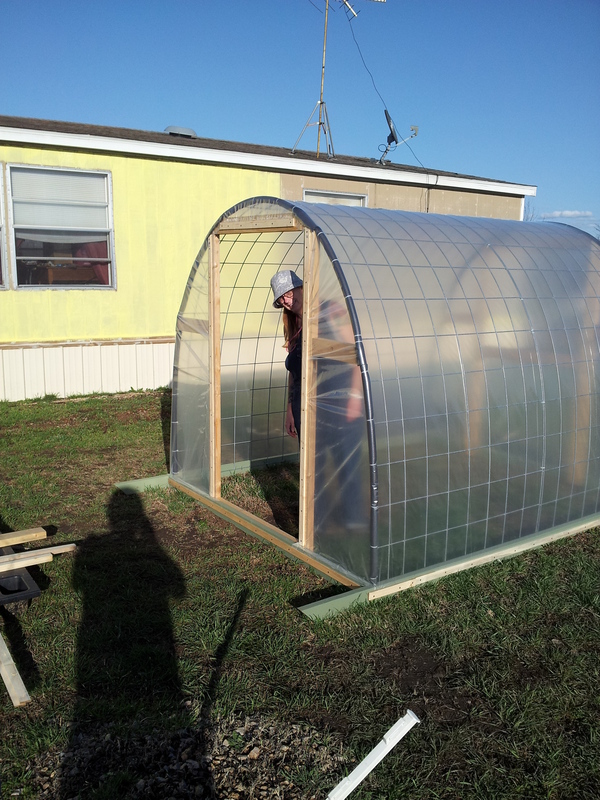 One of the things we did though, was to put the greenhouse where it belongs in the garden/orchard area. Looking good eh? You might notice there is a door in place I covered it and the window one morning and forgot to take pics of the process. Ma and I built the shelves too and we didn’t take pics of that either. Sometimes we are old and forgetful. See that funky looking hinge? 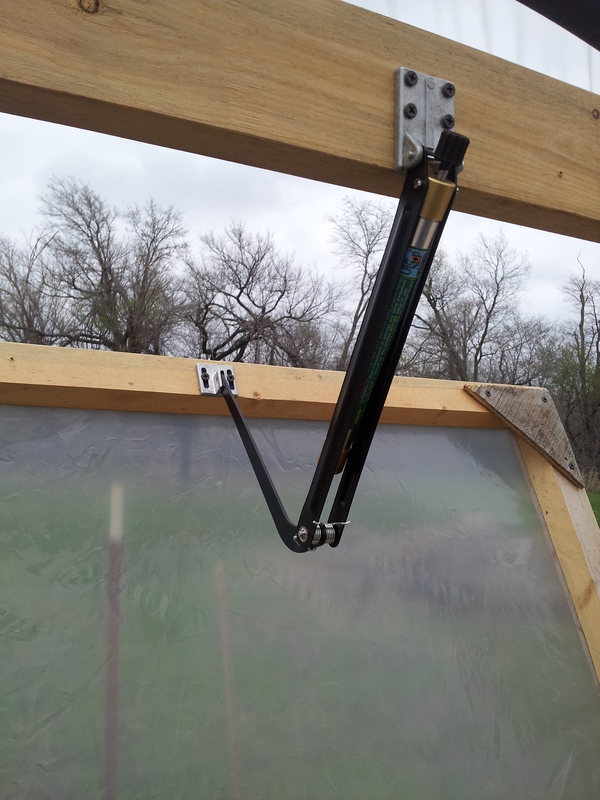 That is an automatic opener, sort of a hydraulic affair, when the oil warms it expands and causes the window to open and vent out the heat that WILL build up in your greenhouse if you decide to build one. There is a close up of the Harbor Freight opener. I have got to rig up some sort of a weight to pull the vent closed as the temps drop in the evening. 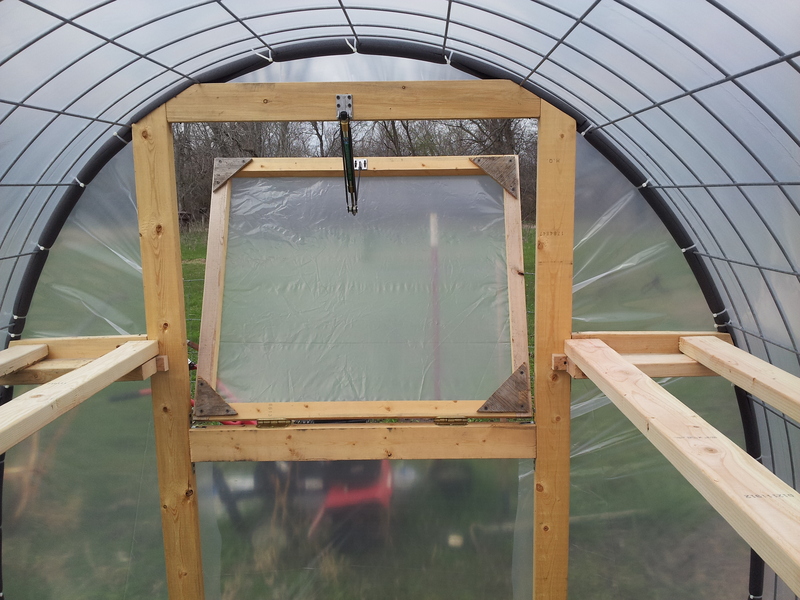 I am going to try using washers and string attached to the top of the window and looped over the first rung of the panel on the end. I’m pretty sure it will work but for now I just go out in the evening and pull the window shut. Tie downs you ask? Well so did my buddy Glen so I knew I would have to come up with something to combat wind induced roll overs that could easily happen when the winds come sweeping down the plain. I do believe Pop’s may have found a much better use for these cork screw type dog tie downs than their intended purpose. How about a close up of the way I attached the tie downs? And this is what it looks like from the inside when it’s been raining. 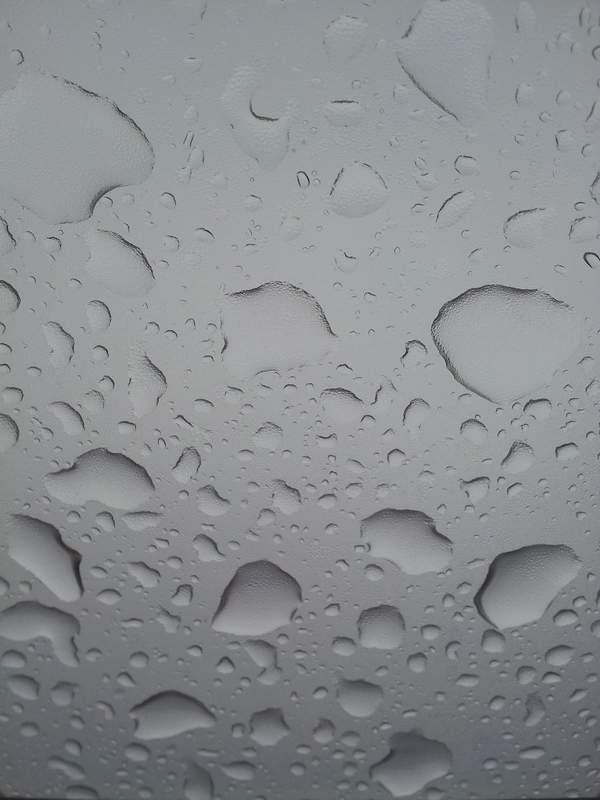 Pretty kewl water droplets eh? 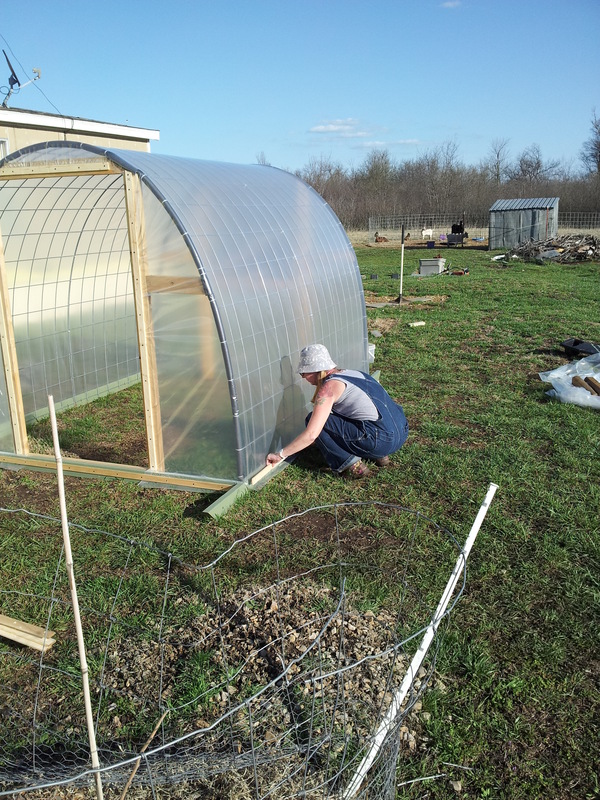 This entry was posted in Gardening, Homesteading, Permaculture and tagged Building, Food, Greenhouse, Homesteading, Kitchen Garden, Oklahoma, Permaculture, Plastic, United States, Water Droplets. Bookmark the permalink. Excellent! 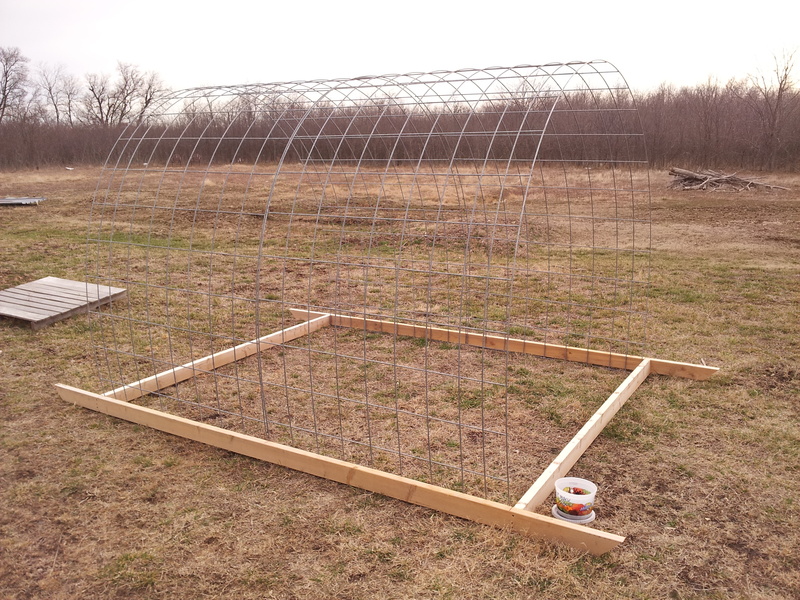 I love the way you just used what looks like cattle or pig stock panel wire for the frame! Looks way easier and more sturdy than PVC! I had been dreaming up ideas all winter and then this idea turned up. I wish I could take credit for the idea. 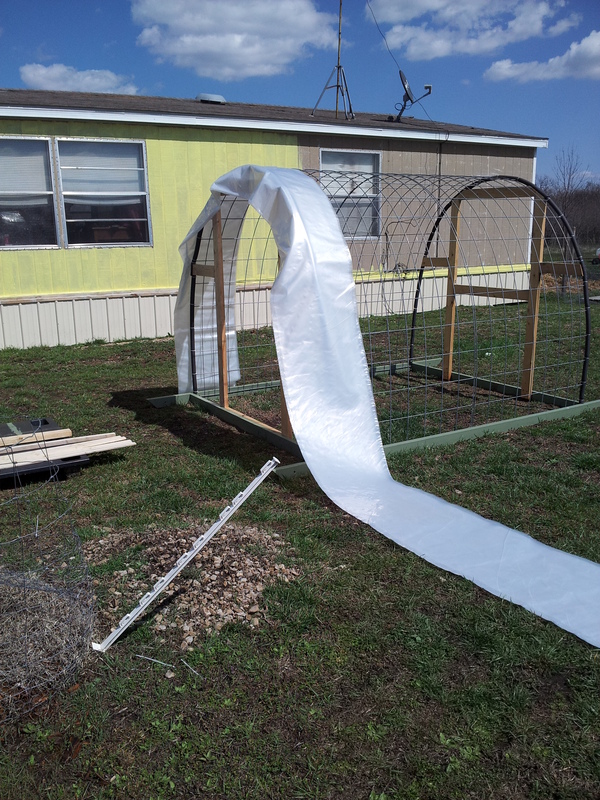 Love your greenhouse, wish I could get the material list and measurements. You can if you go and buy his book. It’s less than $4. Hi! I simply would like to give you a big thumbs up for your great information you have got here on this post. 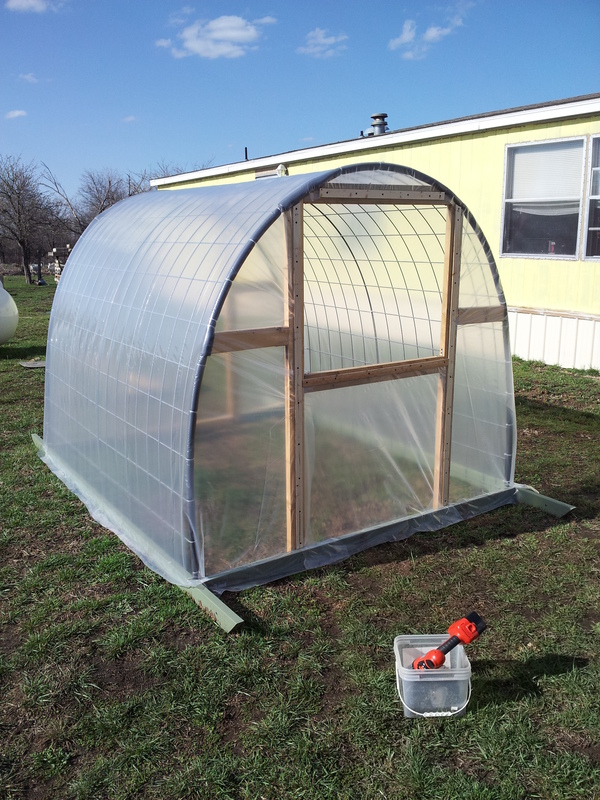 Here’s a great little greenhouse. 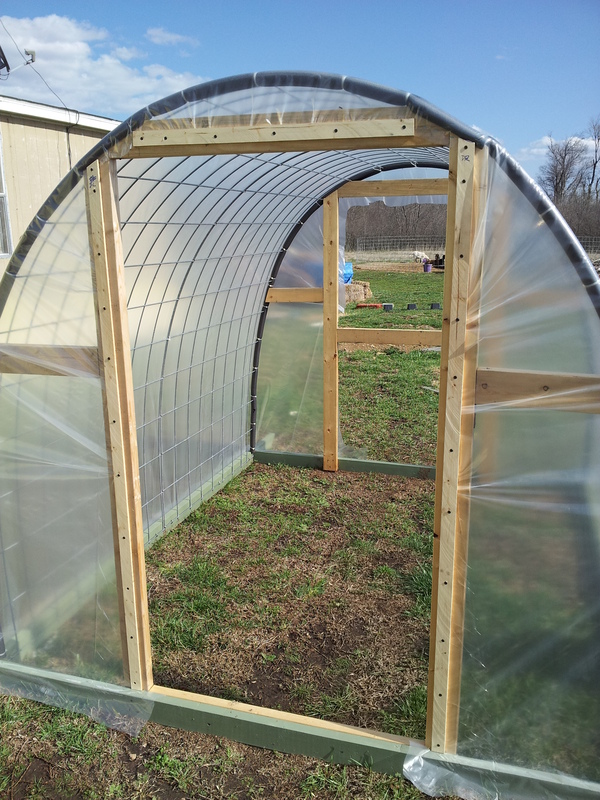 I currently have an extra raise bed measuring 5′ by 10′ , can I turn it into a green house using your design? Awesome!! Can’t wait till spring so I can steal your ideas and build my own! Thank you. Im so excited!! Don’t wait too long, you might want it before then. I can’t wait to try it! I am going to build one once the ground thaws out here! For now my little seedlings will be hanging out in the house with us. Do it! It really is a great little green house, I like the fact that it’s mobile so I can put it in a shady spot in the heat of summer or have it in the wide open when it’s cooler out. Thanks for stoppin by. Pa. 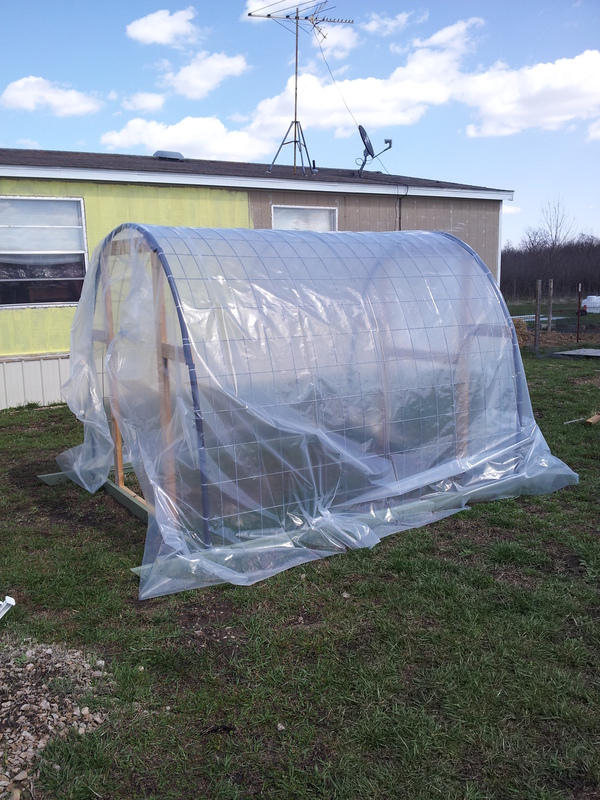 I had a little green house but it got blown away last year in a wind storm. So this looks much sturdier than my other one. Thanks for sharing! We just had some 45+ MPH winds last week and ours never budged. You are most welcome! I currently run Chrome and FireFox on PC and Safari on a mac and none of them seem to have any issues. We can wait and see if anyone else posts any info but if I were you I would try one of those and see if it helps. Sorry for the trouble. I’m not sure what blackberry cuttings you are talking about. What is to base dementions?. I did not see any or a hieght demention. I think this is awesome. I want a greenhouse and have windows and a door but may think this is better. I can have a place to start plants and a cold frame to move about in the garden. Possibly best of two worlds. Dan he (Texasprepper2) gives the dimensions you are asking about in the original YouTube video. 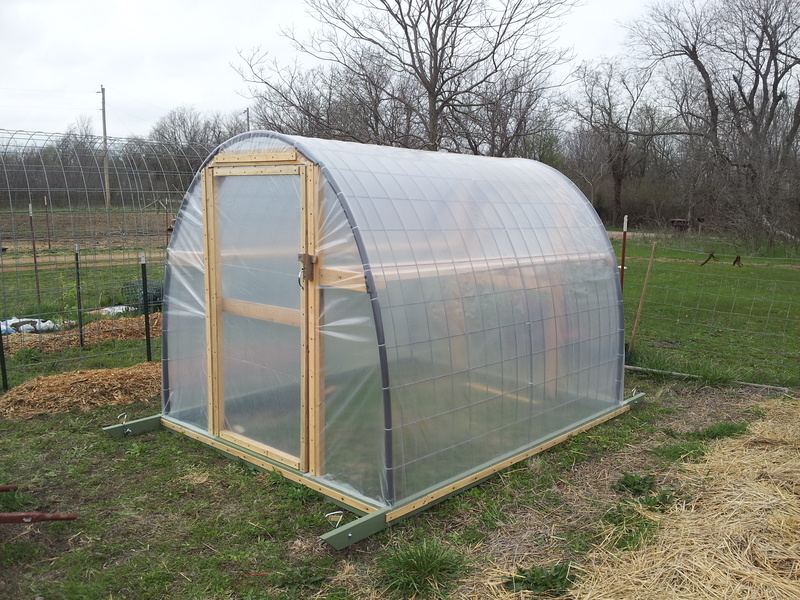 This really is a great little greenhouse but it only ends up being a little over 6ft tall. I say that because if you are really tall it may need to be modified to suit you. Thanks for stopping by. What do you spray to kill the grass around your blackberries? We don’t spray anything on the OKA. If we don’t want grass in an area we mulch with a thin layer of newspaper and mulch. Spray of any kind has no place near our food. 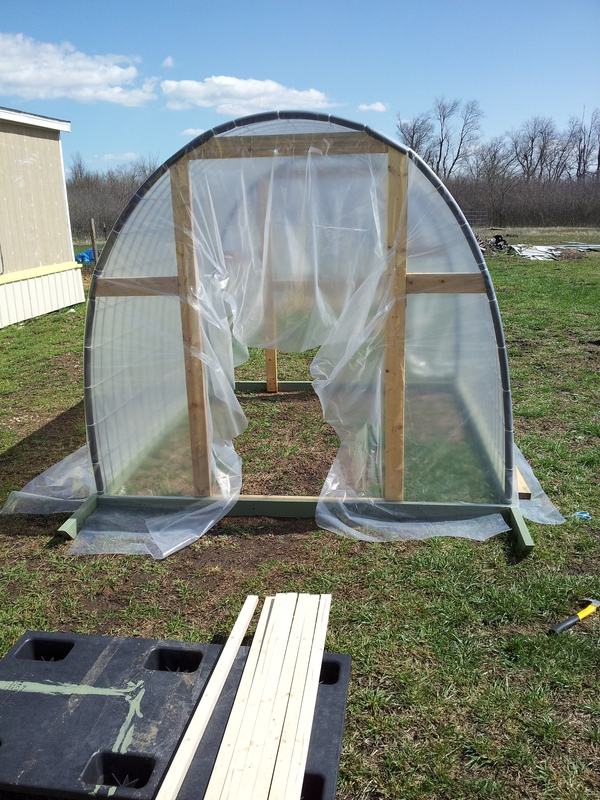 Why post such an informative step by step process of making the greenhouse but say we have to buy the book for the dimensions? That’s just wrong. Do people always have to make money off others? It’s not my book sell. Have a nice day!